This article will examine caffeine and some of the potential benefits on exercise and training performance. Please keep in mind that this article is not recommending you consume excessive amounts of caffeine to boost your performance, while a lot of research in the area has also been conducted on athletic populations. There are also serious health side-effects to consuming excess amounts of caffeine. However, if taken in appropriate, recommended doses, research has supported some potential benefits. This article is merely to educate you on some of these benefits that caffeine may have for you and your training. Caffeine is a diuretic and natural stimulant of the central nervous system found in plants such as coffee plants. Caffeine supplementation invites a controversial debate, as there are numerous health implications associated with its excessive intake. However, research has also determined that when taken at recommended amounts, caffeine is also associated with numerous performance benefits. Firstly, it is important to discuss some of the health implications that can stem from excessive intake of caffeine. Abuse of caffeine intake has been found to increase insomnia, nervousness, restlessness, irritability, anxiety, a fast heart beat and even muscle tremors (1). 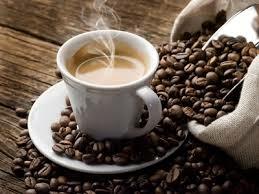 Research has also found that drinking more than 4 cups of coffee per day may increase the risk of early death (1). Additionally, caffeine may increase blood pressure and therefore should not be taken by those with hypertension. It can also increase risk of cardiovascular events, while it may impair glucose metabolism in type 2 diabetics (2). Caffeine is also a diuretic which increases amount of urine production, meaning more water is removed from the body, often leading to dehydration; however this affect has been found to be void with only moderate consumption of caffeine (3). Fat burning: Caffeine stimulates lipolysis, also known as the breakdown of fats (7). This is due to increases in previously mentioned catecholamine’s that increase your metabolic rate. This effect does however fade with frequent consumption of caffeine. Additionally, activation of the sympathetic nervous system can suppress appetite, meaning you are likely to also consume less food (8). Muscles: As a stimulant, caffeine may impact the motor cortex, which is the part of the brain that controls muscle activation (11). Body temperature: Caffeine has been shown to increase the production of heat, or thermogenesis, which may promote weight loss as it increases the body’s ability to burn calories at rest (12). Glycogen: Due to the increase in lipolysis stimulated by caffeine, muscle carbohydrate stores may also be spared, which is likely to enhance duration of endurance performance (13). 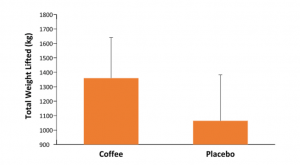 To elaborate on the benefits of caffeine on endurance performance: One study found that athletes were able to cover 2-3.2 km more after consuming caffeine when compared to a placebo group (14). Another study conducted on cyclists found caffeine to be superior to carbohydrate or water consumption, as it increased work load by 7.4% as compared to 5.2% in the carbohydrate-consuming group (15). However, it has been determined that combining both caffeine and carbohydrate supplementation was superior. In research testing coffee, coffee drinkers were found to be 4.2 seconds faster in a 1500m run than those who consumed decaf (16). Another study found that coffee allowed athletes to work harder for longer due to a reduced perception of effort (17). Whilst many studies have found benefits of caffeine on strength training, research is still emerging and the evidence is not conclusive. As previously discussed, the stimulatory effect of caffeine on the central nervous system may make exercise seem like it involves less effort and pain (3). Hence, in high-intensity activities such as resistance training and sprinting, movements can be more frequent and forceful following caffeine consumption due to an increase in the number of muscle fibres recruited for muscular contraction (3). Caffeine may also have a beneficial effect on muscular endurance, allowing you to perform a greater amount of repetitions of a certain weight (18). The below graph depicts a comparison between total weight lifted when performing back squats to failure in a coffee-consuming and placebo group. This study determined that consumption of approximately 600ml (or 2 cups) of caffeinated coffee before resistance exercise was found to significantly improve performance (19). Hence, studies have shown that caffeine can benefit endurance and high-intensity performance, as well as strength and power sports; however, it has been found to benefit trained athletes the most (4). “The recommended dose varies by body weight, but it is typically about 200-400mg, taken 30-60minutes before a workout” (4). 200mg of caffeine in coffee is equivalent to approximately one 12 oz cup. To conclude, please remember that this article was written merely to educate you on some of the potential benefits that caffeine can actually have on performance. It has not been written to recommend you consume a large cup of coffee before each and every workout, as we are not all competing athletes in sport. Looking after your health is of utmost importance and must be prioritised; however this can give you an indication of certain benefits that may arise following caffeine supplementation. Nehlig A, Daval JL, Debry G. Caffeine and the central nervous system: mechanisms of action, biochemical, metabolic and psychostimulant effects. Brain Research Reviews. 1992 May 1;17(2):139-70. Graham TE, Spriet LL. Metabolic, catecholamine, and exercise performance responses to various doses of caffeine. Journal of applied physiology. 1995 Mar 1;78(3):867-74. Rogers NL, Dinges DF. Caffeine: implications for alertness in athletes. Clinics in sports medicine. 2005 Apr 1;24(2):e1-3.